Ever since Rae was born, I've struggled to know what to teach her and do with her activity wise for each stage. I've searched Pinterest for hours and never seem to follow through. I decided a long time ago that designing pretty things and putting it IN FRONT of me daily is the only way that I will take intentional action on what I want to do - one of which is to get creative with Rae and help her develop skills appropriate for her age. Thus, I created these two printables for myself, and for you! 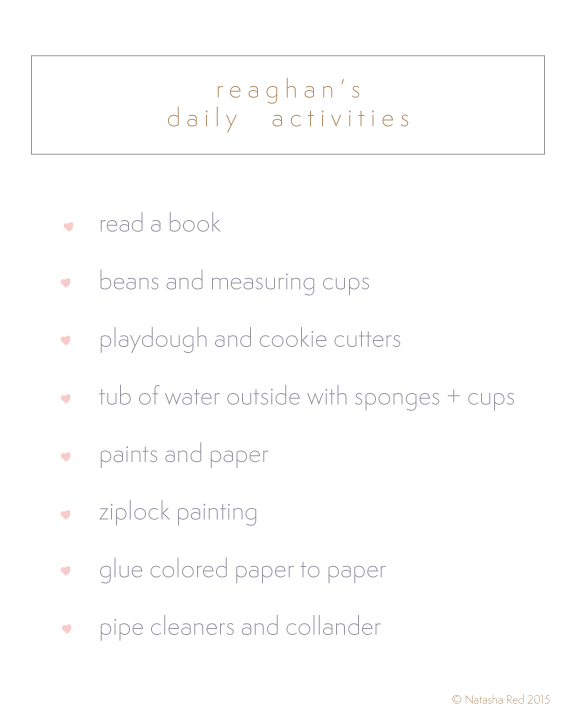 One is a list of all the creative activities I can do with Rae throughout the day. Especially now that winter is here, we will be spending a lot of time indoors (and ahem, baby is due in 4 weeks, so LOTS of time indoors). She's at the age where she is begging to watch TV shows and when I don't have a plan, that seems like the easiest thing to do! Shows every once in a while are great, but I notice that she gets bored and moves on to other toys pretty quickly. I want to fill up our days with activities that will get her mind going and keep her engaged. 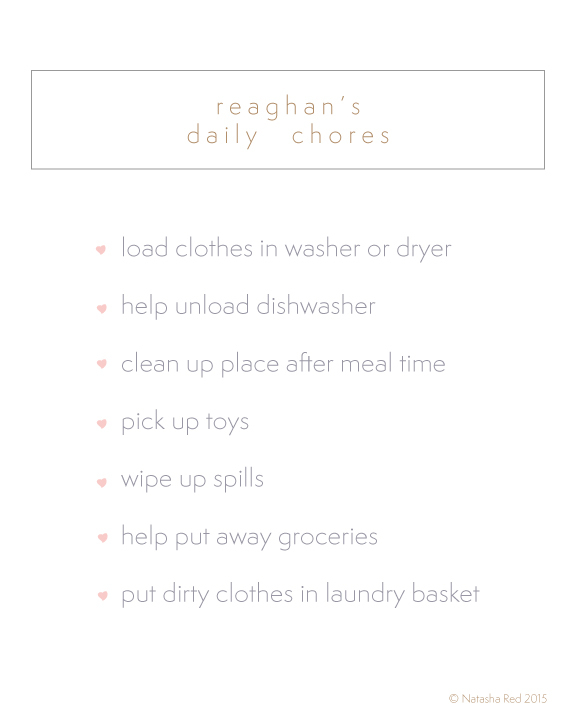 The second printable is a list of chores she is capable of doing. We have her doing these things often, but without a lot of consistency. I want to make them weekly and hopefully daily chores, because like I said, I wont do anything consistently unless it's right in front of me. I plan to have this lamentated and posted on our refrigerator so that I can keep myself accountable to encourage her to help out and become more responsible as she grows. It should be noted that these are based off of 2-year-old skills! CLICK THE PICTURES BELOW TO DOWNLOAD YOUR COPY! I've left the downloadable prints without a name so you can write in your own child's name! I'm not an expert at all in toddler schedules but this is just a small step I'm taking to bring a little more simplicity into our lives for the new year, and I hope it does the same for you!